It was quiet. It was late evening. The rain hadn't let up for many hours. It was a quiet moment at a red light. Checking to see if the rear light was on. A little private bicycle culture moment. Wow! 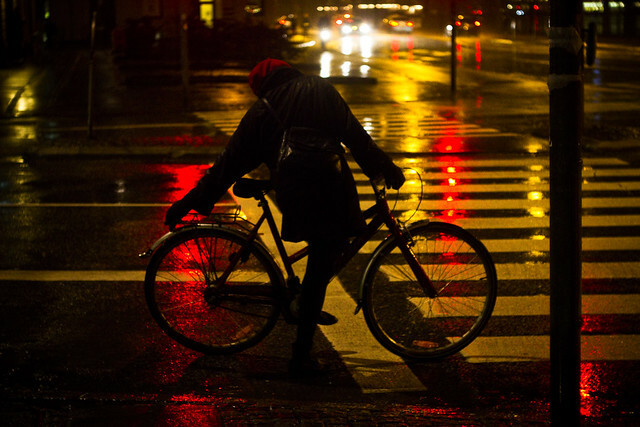 Cycling during night is too risky. Especially when there is no light signals. Escalante - No, it isn't. Skønne stemningsfulde billeder. Kan godt savne at bo i København - og cykle gennem byen om natten i regnvejr - det har også sin charme.